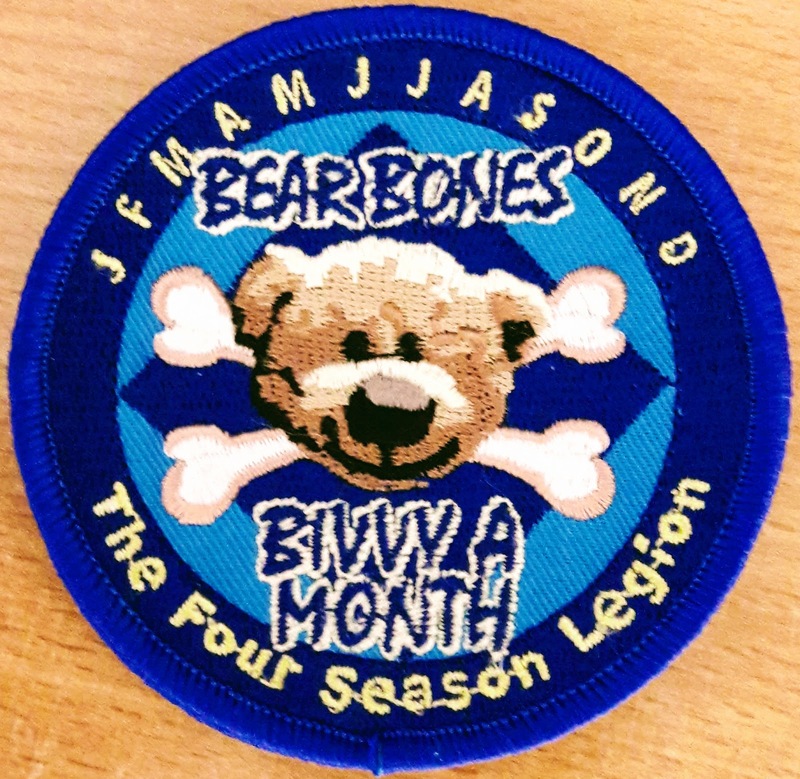 It's a while since I provided any updates to this blog so I thought I'd start by doing a bit of a re-cap and summary of what I've been up to. The bivvy-a-month (BAM) concept has proven to be an absolute winner. When I've been disinterested, poorly or just downright lazy it has provided enough of an incentive to get out for a bit of de-stressing under the stars. Most recent exploits have been fairly local to me. On the one hand, this has reduced the amount of exploring I've been doing. On the other, it has made me even more grateful for living where I do. Many of the spots I've chosen would be great if they came in the middle of some long-distance route, so some readers may find inspiration. In addition to BAM, I've also been chasing another geeky statistic - VeloViewer. Within VV there is a concept of "exploring" grid squares, trying to get to as many as possible and linking them up into Squares or Clusters. Browsing the map I notices a few unvisited squares on the Moray Coast and then one of my colleagues had mentioned Whiteness beach. I was keen to put the two together and scraped in my August BAM until the last night of the month. 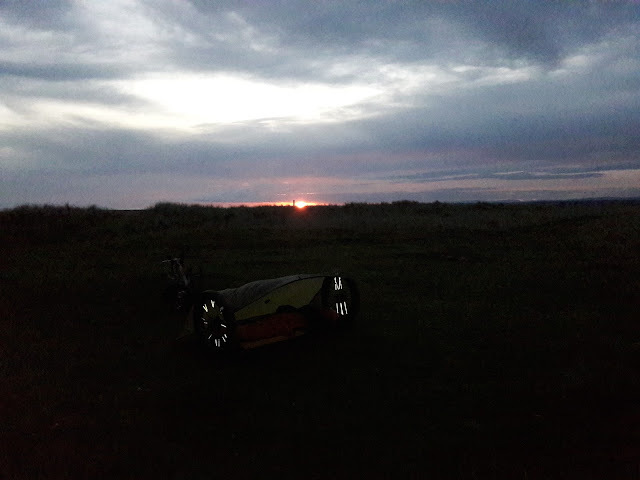 Leaving the van in Nairn, it was an easy trundle across the golf course and then along the ever-narrowing beach until I reached the end of the spit of land. In fact, my course shows me having been into the sea on the maps. I had been prepared for a beach/dune bivvy spot but then I came across this lovely area of grass just outside an old house that has been beautifully restored. 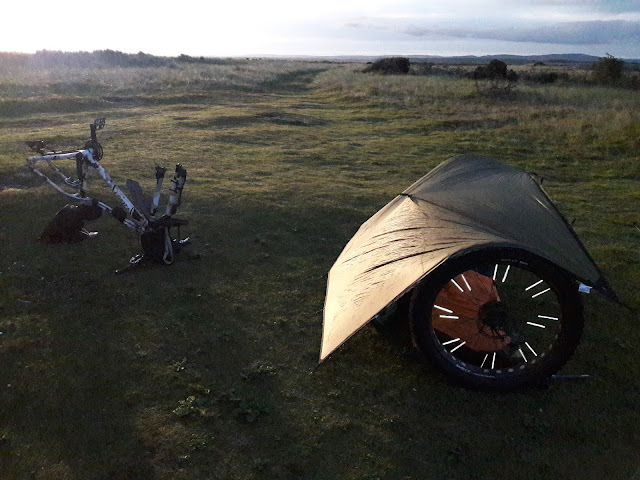 I pitched the tarp using the two bike wheels, looking out to sea. With a bit of a breeze, I was pretty well sheltered and enjoyed a wee bit of supper before nodding off. Unfortunately, the wind direction changed by about 180 degrees overnight, meaning it was blowing into the open side of the tarp. Too unwilling to do anything about it, I just rolled over in my bivvy bag and got back to sleep. It didn't take me long to pack up in the morning and head back to the van, an early start seeing me home for breakfast. 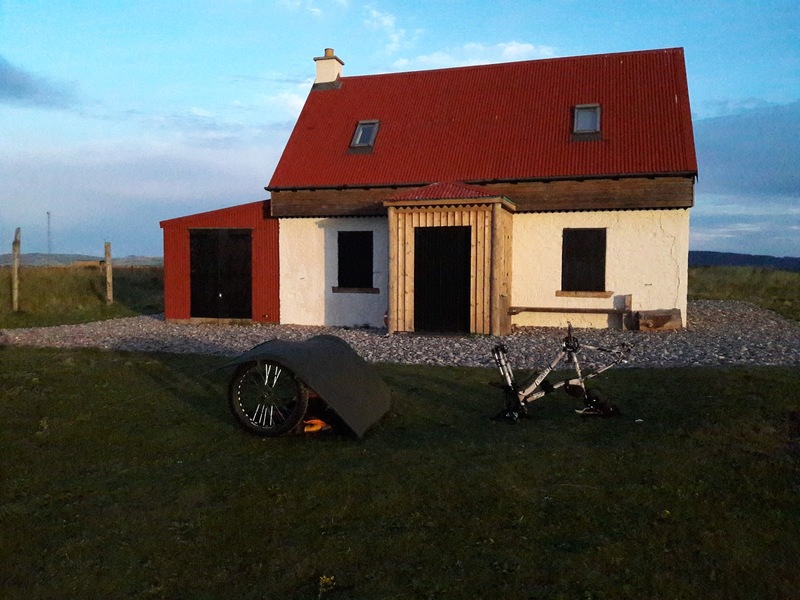 Neill had set off on an Outer Hebrides bikepacking trip and we'd discussed what route he might take back, favouring reversing the HT550 route from Ullapool towards Croick then to Garve. His trip was lass than favourable with a mix of poor weather and some physical discomfort. As a result, I acted as ambulance driver, picking him up in Ullapool and driving him home. However, the seeds had been sown so, as soon as he was able, we decided to ride that route in both directions. I've done the Ardgay-Ullapool poop previously but I hadn't expected quite so much time and effort to get to the Croick junction. Replenished, we headed back up past the quarry in the dark and set up tarp and tent. Before long we were visited by the local farmer, worried that we were poachers. A long, pleasant and rambling conversation followed before they headed off home and we got some kip. We awoke to a dampish morning, the dew having been heavy overnight. A quick breakfast and it was "only" a matter of heading back East again. We took the more direct route to Croick and turned South. At this point, Neill was struggling a bit so I gained a gap and took the very unusual (for me) opportunity to brew up a coffee out of the headwind. We also detoured on the way back to the A835, approaching via Strath Vaich rather than Strath Rannoch. I'd passed the end of Strath Vaich so many time that I was determined to find out what lay in its upper reaches (mainly some estate houses). A further short-cut back along the road brought us back to the vehicles and we both felt we'd had a good ride out. Chat with the local mates had indicated that I might convince a couple of them out for a bivvy before the weather turned too cold and a mild night proved to be just the job. My aspirations were, in any case, constrained due to a heavy fall off my bike, almost ending in a potentially fatal fall into the Spey. With banged up ribs, I wasn't exactly in the mood for a long trip. I'd had an idea of camping at Tullochgrue, above Rothiemurchus. It has one of the best views of the Northern Corries and is also a great spot of the Northern Lights are putting on a display. However, the flatter spots are right next to the road and I knew we'd need a reasonable area for three of us. I took the opportunity to scout the area out and found a great, more sheltered, spot just down the hill. We'd met up with Alex for a pre-bivvy drink... that became two, then three, then four. Fair to say it was quite late by the time we left the Woodshed for the short cycle. With loads of space though, we soon got comfy and we was quite amused by the fact that we could just make out the lights of Aviemore through a gap in the bushes. It's a great spot and one I'm sure to revisit. There's a picture-postcard idea of what it's like when the snow has fallen. Folk imagine that a fatbike will be great, regardless of the snow conditions. In truth, there are long spells when the snow on the paths and tracks has been compressed into a bumpy, icy, assault course. So it was when I was trying to fit in a November bivvy. Road or track, both were affected by ice so I knew I wasn't going to be going far. Fortunately I remembered that I'd been meaning to try a pitch beside Loch Pityoulish. 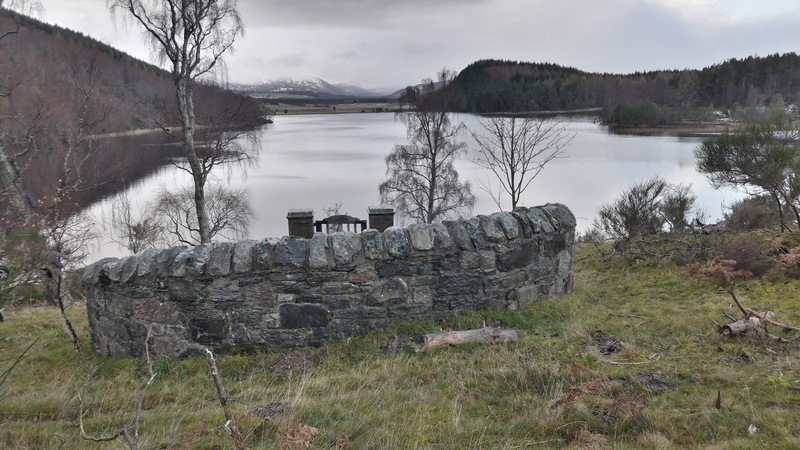 The one, almost permanent, downside of the spot I had in mind is that it is subject to the prevailing wind coming off the Cairngorms and whistling across the loch. However, the wind patterns offered an opportunity, the wins having swung round to the North West. I managed a whole 4 km or so from the house before it clicked that I'd forgotten my sleeping mat. I returned briefly to pick it up then almost through the bike down the road crossing a patch of ice. The track through Rothiemurchus deer farm proved to be one long sheet of ice that I had to navigate via its narrow verges. The spot I'd sought out turned out to be ideal, well sheltered and with a view of the open skies and snow-covered hills. It was noisy though. The sound of the A9 traffic was drifting from the West, no doubt helped by that breeze. It proved to be quite a cold night too, though I was more than warm enough in my winter-weight bag. As I was packing up in the morning I spotted a bit of stone wall on the wee hillside above me. I discovered it was a tiny graveyard with a tremendous view. This was another VeloViewer chase (see August). 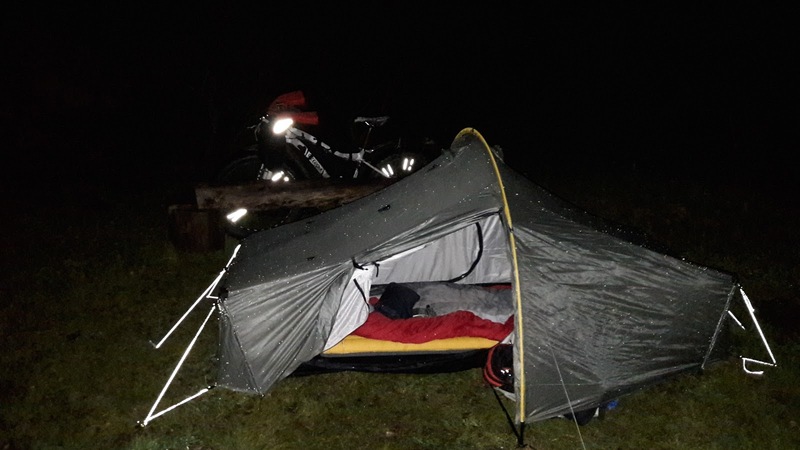 I'd spotted a couple of squares that I'd somehow managed to bypass on other rides and walks so concocted a short route to link them up, coupled with a choice of bivvy spots. My route initially took me past Carrbridge then across the A9 into an area of forest just south of Slochd. The map showed two sections of forest track approaching with a couple of 100 metres of each other and I hoped there would be a way to link them. As it turns out, the map is out of date and there's a very good forest road leading down towards Sluggan Bridge. This was my first likely camp spot. However, the cold, still air had settled down in the glen here beside the river and I hit a very cold area - around -6C - with hard frost on all the grass visible in the mooonlight. At that point I decided that my second option - high up the hill - was likely to be better. The tracks leading up Carn Sleamhuinn are rough and bouldery and would be familiar to those who had walked or ridden the Burma Road before it was somewhat tamed. I had to make a detour of 500m or so to make sure I visited one of my wanted VV squares. As I climbed, I was on the look out for a likely bivvy spot but once I was with 500m or so of the summit cairn I knew that's were I would end up. The ground is broken peat on a sandy base but I managed to find one lump big enough for the tarp. Amazingly, given the altitude and exposure, there was little breeze. I could just make out a bit of a glow from the lights of Aviemore, steeply beneath me. It was a good nights sleep, though the wind suddenly made its presence felt around 8 am, gusting over the tent. 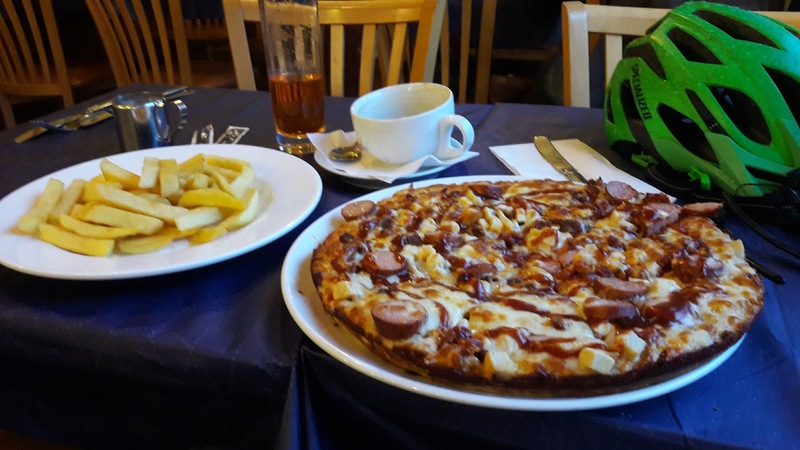 I just turned over and tuned it out for a while but, eventually, my bladder declared the moments respite over so it was a matter of quickly bundling everything together, strapping it on the bike and heading home via another VV detour. So - that's me managed 12 out of 12 for 2017 (with some additional bivvies not documented here in addition to that). 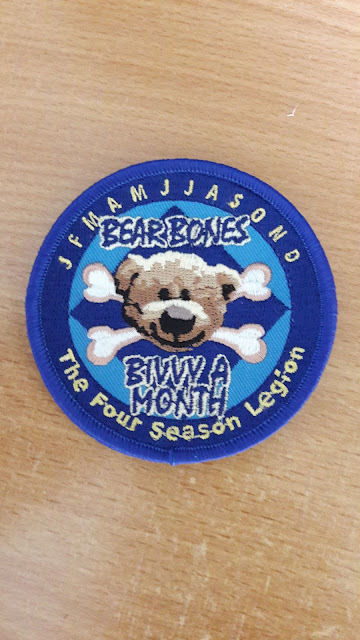 As a "reward" Stu for BearBones commissioned a badge for those completing the collection. I must say it looks mighty fine. At the start of this year I decided I was going to stay away from year-on-year comparisons of how far I'd ridden, how many metres of ascent I'd racked up and just relax into enjoying my riding. Almost inevitably (as seems to have happened in may previous years) summer has come round and I find I'm now doing less than I was in the cold, dark months. It's like I've just got a bit bored, or just not as well organised. Couple that with the constant stream of updates on Facebook and Twittter, of posts on forums etc and I'd started to develop a bit of depression. It seemed no matter how much i wanted to get out, I always found an excuse not to. What's more, I've simply got out of the habit of doing long days and certainly not multiple long days. The sensible approach would, of course, be to build up my stamina again, with a longer term goal in mind. 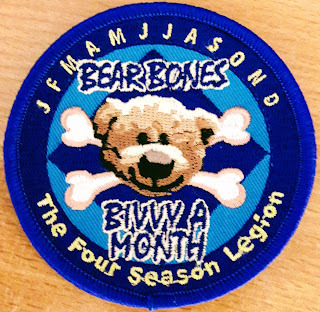 However, with a fairly busy July I thought I'd better get something done about my "bivvy a month" plan. Not being able to coordinate with my usual companions also gave me the opportunity to try out a 200km loop I'd been contemplating that might require a bit of experimentation and where I'd rather not drag an unsuspecting guest with me. 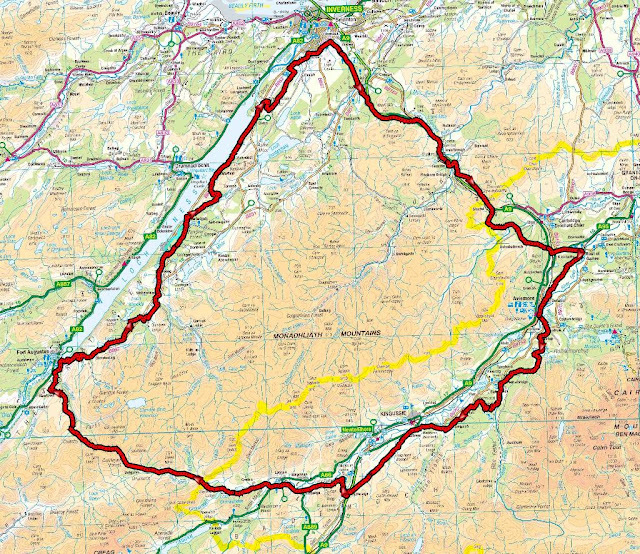 The premise of the route was simple enough - use a combination of old military roads and the new(ish) South Loch Ness Trail to circumnavigate the extensive and fairly empty area of mountains known as the Monadliath. In my case, that involved starting in Aviemore and I headed out from home on tracks I know really well. I don't normally stop to photograph this as I see it so often! Tonights destination in the distance - under all that cloud! Heading south through Glen Feshie and then out to Insh, I found a section of track that used to be very boggy has now been resurfaced. Perhaps as part of the Speyside Way extension to Kingussie? This was a bog last time I rode it. Once at Ruthven Barracks I was now essentially following the old General Wade Military Road all the way to Fort Augustus. Evidence of the route is everywhere, the many bridges, the culverts and the straight lines. Wades men were paid by the mile and he didn't mess around with many bends! Not heavily used, this section nut a good link between the Cairngorms Loops and the HTR 550 ITT routes. Don't say you've not been warned!! I'd been expecting rain all day and as I approached the minor road at Catlodge it put in a brief appearance before abating again. However, it still looked dark and foreboding in the West and by the time I reached Melgarve Bothy it was full on. I actually considered stopping here instead of carrying on up the hill but decided that it was still too early and would give me a very, very long day 2. It got wetter and wetter as I climbed and the exertion meant I was soaked through by the time I reached the top of the zig-zags and the old hut on the col. I'd been avoiding looking at the time all day, preferring just to ride until I felt ready to stop but in checking the GPS, I caught sight of the Time and it turned out to be after 8pm. By now, all I could think about was getting inside somewhere for warm food and a drink, and thinking the chippy closed at 9pm, I careered down off the summit as fast as I dared. 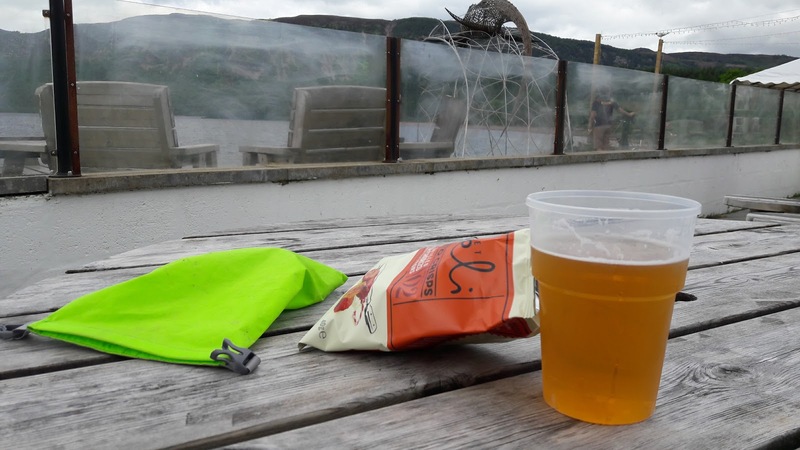 I reached Fort Augustus at 8:45, parked up the bike and presented the soggy mess I was in the chippy, taking off my wet helmet and jacket and dashing to the counter, only to be told they were open until 10!! A huge pizza was ordered, along with both hot and cold drinks. Despite my hunger, I could only manage around half of the food but I was in no hurry anyway as at least I was warming up. All the meat. ALL OF IT!!!! At almost 10, I headed out into quite a pleasant evening. The clouds had all but passed over and everything smelt very fresh. Now I'd be following the South Loch Ness Trail to Inverness and I found the new section on the outskirts of Fort Augustus that avoids the steep road climb - not that this was any less steep. After a couple of miles, the track ended at a compound for the new windfarm construction and it wasn't clear how I was supposed to get back to the road. I found a watchmans hut and knocked on his window, giving him a huge fright. After pointing me in the right direction, he asked if I was stopping for the night and I replied that I'd been planning on Loch Tarff. He suggested a spot behind a large mound on the main parking layby. The advice was great. i was able to get right down to the lochside, taking advantage of the breeze to keep the midge at bay and I was pretty well hidden from any passing traffic. I awoke to a lovely morning and had a relaxed breakfast. I fact, I was enjoying just being there so much that I sat for much longer than usual. I'd have stayed even longer if I'd had more gas for my stove and more coffee to drink. Eventually, I got packed up and headed up the "steep" part of the SLNT to the summit of "the Suidhe" - a view that rarely disappoints. Lovely old section of road - buzzards mewling on both sides as I shot this. From here, there's a wide variety of paths, tracks and backroads to Foyers where I arrived to find the Waterfall Cafe was open and serving breakfast. That was too much of a temptation and resulted in another lengthy halt. Always worth exploring if you've time - but leave the bike. I was now faced with a choice; the official SLNT route takes a hilly and rough route to Inverfarigaig and the suggestion is that cyclists avoid the worst of this by heading along Gleann Liath. Opting for the "full experience", I chose the footpath. Having now done both options by bike, I strongly suggest the Gleann Liath variant if on two wheels. Having reached the level of Loch Ness at Inverfarigaig I now had the delight of the "Corkscrew" road. It's hard to describe this. The zig-zags are steep, tight and narrow but at least have most of their complement of tarmac. Once it starts to flatten out though it deteriorates into no more than a rough farm track. However, it's an efficient way to gain height again and the climbing continued all the way up to the Fair Haired Lads Pass. From here, I was treated to a great view of Urquhart Castle and Loch Ness before once again taking my inappropriate bike down a really steep, switchback descent. Yes, this is a "road"
Start of the descent to Loch Ness. Wrong bike again! By the time I reached the lochside again I was almost at Dores and, once again, the temptation to stop was too much. This time I just opted for a cold beer and a packet of crisps but I was aware that overall I was much slower than day one. Another steep climb took me back onto the off-road section of the SLNT and I was eventually spat out onto the Inverness Distributor Road. This just felt weird. The vast area of tarmac seemed quite alien after two days of being almost always off-road. Before long I was at the Old Edinburgh Road and once again hooking up with General Wade towards Aviemore. I'd tried this route before but was obviously much fitter the last time. The hill out of Inverness seemed relentless and I was too weary to get up enough speed to outrun the many flies that were buzzing around me. It was a relief when it finally started descending again, though the track has been gated off at one point (to be reported) and is overgrown for a short distance. The section round the quarry and over to Moy is mostly fine - a great place for a "gravel" bike - but the final couple of km, which is always boggy, has been made even worse with some felling under way. An alternative here would be to use the soft shoulder of the A9 for about 1km and I reckon I'd do that next time. In fact, this whole area could be transformed once the A9 dualling work reaches this section. Reaching NCN7 at Moy, I followed this to Tomatin for yet another break. This was when I discovered I'd left my wallet at Dores. After a moment of panic, I called the Dores Inn to find that it had been handed in. That over, I managed to pay for a drink and a bit of chocolate with my phone. Exiting Tomatin, I was now on the only bit of todays route I hadn't ridden. It's a short section of farm track that bypasses the flooded Wade Road up to the Slochd. I expected I'd be off pushing for much of it but surprised myself with a slow, but steady, pedal up until I was higher than the main road and could, at last, see the Cairngorms in front of me. I decided to stay on NCN 7 for a while and was soon over the lovely bridge at Sluggan. The next climb was another on which I expected to be walking but a bit of determination got me over it for the fast descent to Kinveachy. So fast, actually, that I took a wrong turn and found myself exiting onto the A9. Thankfully, the road was quiet and only a handful of vehicles overtook me before I found the crossing I'd meant to take and picked up NCN7 again through Boat of Garten and back to Aviemore. Having completed this loop, it occurred to me that others might want to follow suit and I thought it might be a bit of fun to give it a name - I'm thinking the Monadliath Military 200. If I get around to it, I might even create a web page with more info and a record of completions. I guess a decent time would be around 36 hours, though I really would encourage folk to take their time and explore lots of the other wee bits off-route, like the Falls of Foyers. 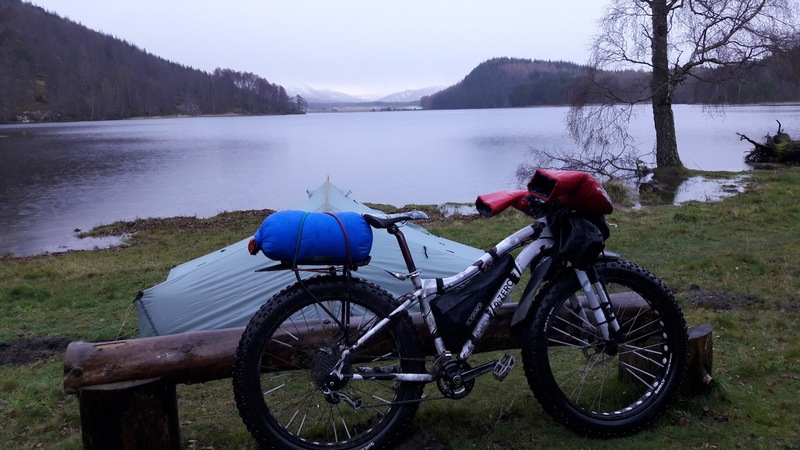 The section of this route between Laggan and Tromie Bridge also provides a mainly off-road link route between the Cairngorm Loops and the Highland Trail 500 bikepacking routes should anyone want to join them up into a Scottish Highlands Mega-route!